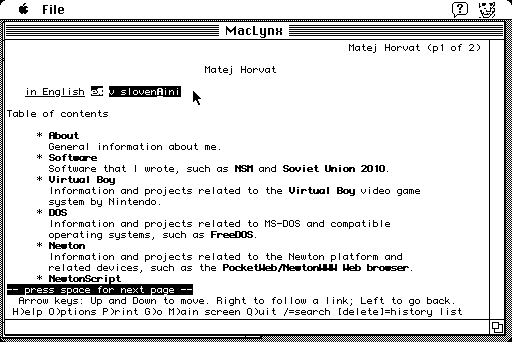 As far as I know, MacLynx is the only Web browser that runs on a Macintosh Plus that supports the HTTP "Host" header (unless you use MacWeb with MacProxy on another computer). However, it has a rather serious bug: it advertises to Web servers in the HTTP "Accept-Encoding" header that it supports pages compressed with "gzip" and "compress", but actually doesn't. When a server complies and sends back a compressed page, MacLynx complains it can't read it. One way to solve the problem would be to modify the source code and recompile it, but it is far simpler to just modify the executable. First published on August 25, 2015 . Last updated on August 25, 2015 .